Listen up everybody, I found the easiest most yummy fudge recipe you can make in only ten minutes WOW! While blog surfing tonight, I chanced upon the most yummy-licious site ever. Seriously, the Thanksgiving Recipes I found at the site sounded so delicious it got me wishing we actually do celebrate Thanksgiving just so I could hurry out and buy a fat juicy turkey to try out the recipe! There are tons of cool Easy Recipes available and with so many categories like Salad Recipes, Kids Recipes, Healthy Recipes, Halloween Recipes, Christmas Recipes and Cookies Recipes; I spent almost an hour going nuts on recipes! In fact I still have not covered the Cake and Desserts sections yet as I was already confused with so many different and delicious recipes to choose from! I was however, most delighted to see a recipe for Banana Bread. I love banana bread, fresh and warm from the oven; thickly sliced to be enjoyed with a nice hot cup of black coffee - heavenly! 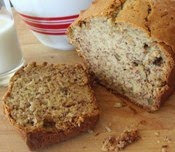 I think home-made banana bread is the best; even better than the ones you can get in bakeries and cake shops. Just talking about it makes my tummy rumble but the good news is that I now have the recipe for my favourite banana bread too! And of course there's the 10 Minute Fudge Recipe I mentioned at the beginning of my post. It's been a while since I enjoyed some choc fudge and I've never actually tried making them. But now I can, thanks to the delicious new recipe I found! You won't believe how easy it is to make the 10-minute creamy, velvety chocolate fudge. Here are the ingredients but you have to visit the site for cooking instructions (under Fudge Recipes). I want you to personally experience the delicious goodness I felt after visiting this site. You won't be sorry you took the time to visit and I bet you too will leave with several great recipes to try this holiday season. Happy cooking! How la to BD, at this hours i am still awake, and now, cakap makan-makan dan resepi lagi. Eh suddenly i am hungry. Eh Rizal sekarang I can see ur comments on my TF…..
Oh my...D licks her lips. Wah just woke up at 4am! I was playing game earlier, didn even drop EC lolz…. oh what scrumptious treats Mariuca!!! War...I haven't take my breakfast yet! So hungry looking at the bread. my daughter would surely love to get the recipe and bake some. They look so yummy. Wah! I feel hungry looking at those photos! Now's near lunchtime! Don't know how to cook la...maybe you bake me a banana bread and courier to me. Haha! Oh this reminds me, maybe should go for another round of that yummy choc cake from PJ Hilton which is selling at an amazing RM25 for 1kg! Wonder if the offer is still on. OK, dropping my EC here today. Once in a bluemoon kinda thing, haha! Have a nice day! Btw, you woke up oredy? Haha! Wah.. that looks so delish and easy GP!! have you tried it? how did it turned out? It does look yummy LJ and easy to make oso! Another easy peasy mug cake phase in the making lol! Me too Foong, esp the soft fluffy ones YUM! i better try it really. do you like baking? i have some nice recipes with me.